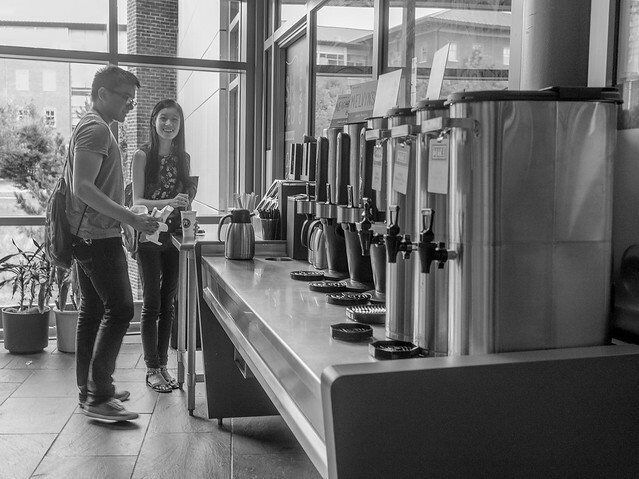 When I came back to work at the University of Illinois, I found that a local businessman was running a coffee shop with branches in the Siebel Center and the Mechanical Engineering Lab. In the spring of 2015 he decided to get out of the coffee business. The shop in MEL is now vacant, but the Siebel location was subsequently occupied by the Einstein Bros. bagel-and-beverage-and-pastry chain, which has set up this gauntlet of coffee and tea canisters for thirsty customers to fill their cups.